TELESMA has been impacting the Baltimore music scene for almost a decade. TELESMA blends psychedelic rock with electronica which results in some groovy music that can get the audience dancing. Some of the instruments musicians play in TELESMA are different from the norm and can not be found anywhere else. TELESMA is made up of Ian Hesford, didgeridoo/kubing/percussion, Jason Sage, keyboards/percussion/vocals, Chris Mandra, guitar/mandrum, Bryan Jones, bass/electronic percussion, Joanne Juskus, vocals/percussion/karatalas, Rob Houck, drums/electronic percussion. They have been playing many shows and festivals since they started and continue to spread the word on their weird and funky sound. Check out my conversation with Chris Mandra on the origin of TELESMA and how they impact the Baltimore music scene. Q:What instrument do you play in TELESMA? A: I play guitar, analog guitar synth, sing, and “manDrum” (a wearable electronic interface I worked on @ STEIM in Amsterdam). Q: When and how did TELESMA form and start playing shows in the local area? A: TELESMA was formed in 2002 by Ian Hesford (didgeridoo, kubing, dumbek, percussion) and Jason Sage (keyboards, percussion, programmer, lyrics). In early 2004, the two then added musicians Joanne Juskus (vocals, percussion, karatalas), Chris Mandra (guitar, analog guitar synth, his unique manDrum, and vocals), Bryan Jones “Jonesy” (6 string MIDI & upright basses, theremin, percussion), and Rob Houck (drum kit, percussion, electronic drums) to complete the lineup. Q: What or who made your band want to go in the electronica genre? 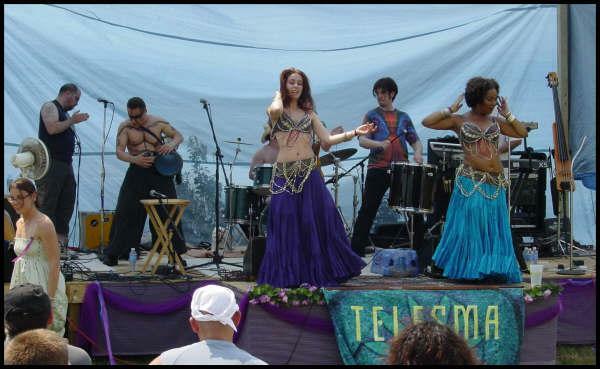 A: TELEMSA is a group that uses electronic instruments along side ancient instruments (by some accounts the didgeridoo is 10,000 years old). We just do what we like and our interests are significantly varied to make electronics part of that. I got into eletronic music in the early 80’s because of my love of the electric guitar and signal processing. It’s interesting that today almost anything you do could be considered “electronic music” because it all uses electronics to manipulate the audio in significant and sometimes outlandish ways. Q: How was the audience reaction/response when TELESMA first started playing shows? Has it changed since your band has progressed and how so? A: The audience reaction has always been overwhelmingly positive. I think it’s very hard to not see Ian play the didjeridoo and not get excited. It’s pretty amazing, visceral stuff that resonates with people.